While overall wine sales are on the rise, studies have shown that the way we enjoy our wine is drastically changing. More consumers are reaching for wine daily rather than just on special occasions. Others are enjoying their wine at home instead of in a bar or a fancy restaurant. With good, quality wine being more accessible than ever at your favorite grocery store or online retailer, you may have started your own wine collection at home. With so many options available, we’ve put together a list of factors to consider when choosing the perfect wine refrigerator in this wine refrigerator buying guide. Wine refrigerators can be large or small, built-in or freestanding. Some have noisy compressors, while others are whisper quiet. To ensure that you choose the wine refrigerator that best fits your needs, you first need to decide where you will be placing your unit and what your storage needs will be. Where Will You Be Storing Your Wine? Will you be placing your wine refrigerator in your home, perhaps in your kitchen or in your living room? If you will be purchasing a smaller refrigerator, you may want to consider one that uses thermoelectric cooling rather than a traditional compressor. Thermoelectric wine refrigerators are extremely quiet, reliable, energy efficient, and vibration-free. Keeping your wine in a perfect state of rest. If you will be placing your wine refrigerator in a garage or basement, you will want a wine refrigerator with a strong compressor system to ensure cool and consistent temperature. Always make sure to place your wine refrigerator in a location where it has access to fresh air to keep humidity and temperature fluctuations to a minimum, something that is especially important in utility areas. Do not install a wine refrigerator outdoors unless it has been specially designed for outdoor use. When investing in a wine refrigerator, consider the amount of available space you have, and know that there are many options to make the most of it. Freestanding units are great for those with lots of extra space and offer the widest variety of sizes. Small portable models are available that can be conveniently stored on your countertop, while larger models on the market can store hundreds of bottles at one time. Save space and blend with your existing decor by building these models into your counter or cabinetry. Generally, built-in units vent from the front while most freestanding units vent from the back. If this is the case with your freestanding unit, make sure you will be able to place it in a location where the vent will not be too close to the wall and the unit will have access to fresh air. When you start running out of nooks and crannies to store your bottles in, it’s definitely time to purchase a wine refrigerator, but don’t make the mistake of choosing a model that only holds what you currently own. Consider whether wine collecting is going to be a serious hobby for you in the future and if so, choose a model large enough to accommodate your growing collection for years to come. How Big Are Your Bottles? Some wine coolers have only been designed to store “standard” 750 ml wine bottles, but you may have noticed that your own collection features bottles of all shapes and sizes. If that’s the case, you may want to choose a wine refrigerator with adjustable shelves made to move up and down or removed entirely to make room for larger diameter bottles. Allavino has specially designed their FlexCount Series of wine refrigerators with more space between shelves than other wine refrigerator brands, allowing you to accommodate these bottles without needing to remove shelves and drastically reduce your storage capacity. Red, white, and sparkling… oh my! When you start exploring the wide world of wine, you’ll soon discover that the variety is endless. Take a look at the kind of wines that you have been purchasing and their ideal storage conditions. If they are all very similar, a wine cooler with a single temperature zone will work perfectly for you. If you like a wide variety of wine, however, a double, triple, or even quadruple zone wine cooler will be a much better fit. Love more than just wine? It doesn’t have to be the only beverage in your home to receive special treatment! If beer or soda also quench your thirst, a dual zone wine and beverage refrigerator might be just the thing to keep all your beverages at their most refreshing temperature. When investing in an appliance that you’ll see every day, making sure it looks great is just as important as making sure it works great. Don’t forget to consider the following design features when selecting your wine refrigerator. An important design feature to consider when purchasing a wine refrigerator is the type of door you want it to have. 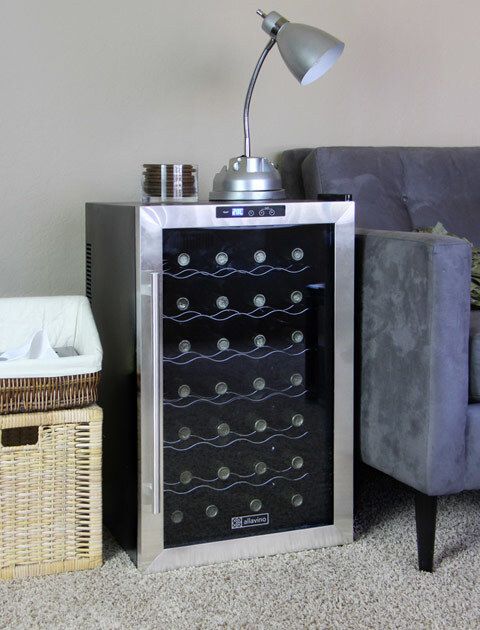 Some wine refrigerators have a solid stainless steel or wood finish door that offers total protection again harmful light and UV rays, while tempered glass doors still offer protection while allowing you to easily view and show off your collection. Some models feature reversible doors that make it easy to change which way your wine refrigerator door opens. Which makes it possible to place your unit in more locations. Living With Teenagers or Roommates? If so, you may want to make sure that your wine collection is locked up tight. Look for wine refrigerators with locking doors to keep your bottles secure. These locks usually come in the form of a lock and key combination. Don’t Be Afraid of Light! Wine is extremely sensitive to harmful UV rays, as well as incandescent lighting. heat your wine bottles and cause damage. We recommend choosing a wine refrigerator with LED lighting, which will not significantly raise the temperature in your cooler. Not only is this form of light gentle and safe for wine, but it provides an elegant showcase and makes it easier to read the labels on your bottles. A major design factor that will impact the way you store wine is what type of thermostat you will be using. 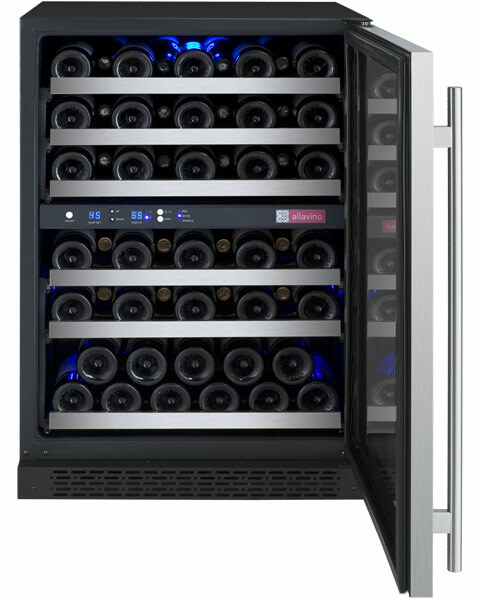 Manual, electronic, and one-touch systems give you different levels of control over your wine cooler’s temperature. Manual thermostats can give you a greater range of temperature control, but it can take some trial and error to find the ideal setting. Electronic and one-touch systems usually limit your temperature setting to pre-determined ranges optimal for wine storage. Also, their digital readout makes setting and viewing an accurate temperature much easier. Once you have a better idea what kind of wine refrigerator you’re looking for, browse our large assortment of models to find the perfect one for you. We also have a wide variety of other wine accessories like glasses, bottle openers, decanters, and fun gifts for the other wine lovers in your life. Wine Guide, Refrigerator, Wine. permalink. Does anyone know of a manufacturer that make a wine cooler that holds 100+ bottles (really) and accepts pinots and chards without having to remove shelves? A novel approach to wine storage.